With their victory passing statewide speed cameras one might think Big Brother would take a breather before pushing the line any farther. Apparently not so for a few lawmakers. Sen. David Harrington from Prince George's County has sponsored a new bill, PG307-10, which would authorize the cameras on two specific roads -- Chillum Road and Sargent Road. Apparently Prince George's County found a few small segments of road where they could not legally create new school zones solely for the purpose of deploying speed cameras, as was done by Baltimore City and almost every town in Prince George's County which has authorized the cameras so far. (Towns and counties had the ability to create school zones long before Senate Bill 277 was passed in 2009 -- in fact SB 277 did not change the criteria for or definition of school zones at all -- but those local governments never thought it was worthwhile to create these school zones until the revenue motive for adding cameras was introduced). PG307-10 would allow cameras to be added on these two additional roads without the need to create school zones. This would set a precedent for creating case-by-case exemptions for any location which does not meet the existing legal criteria for using speed cameras. Elsewhere, Montgomery County Delegation chairman Brian Feldman is sponsoring bill MC10-10 which would create a new revenue sharing system between Montgomery County and small towns like Poolsville and Barnesville. Currently towns which do not have their own police forces or speed camera programs have had cameras placed on roads in their jurisdiction by the county. However unlike towns which run their own programs (such as Takoma Park or Chevy Chase Village) do not receive a cut of that revenue. Strangely enough, some of those towns have complained about the cameras when they do not get their piece of the pie. 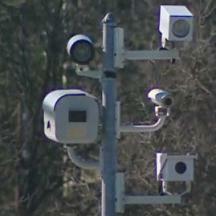 A "side benefit" to this legislation would be that towns with particularly lucrative cameras in their jurisdictions (such as those managed by Chevy Chase) would have the option of turning them over to the county and issue twice as many citations before hitting the revenue cap built into SB 277, with the revenue divided between the local jurisdiction and the county rather than going to the state -- even if (as is the case of affluent Chevy Chase Village) the town's cameras are on state owned roads paid for with state tax dollars. The above bills would need to be approved by both the state House of Delegates and Senate and if so would take effect October 1, 2010. However we predict that there will not be major changes to speed camera laws this year because all state lawmakers are all up for re-election in November 2010, and many would prefer that the hundreds of thousands of voters who will receive those citations will not recall their 2009 voting record on statewide speed cameras, which you can see HERE.